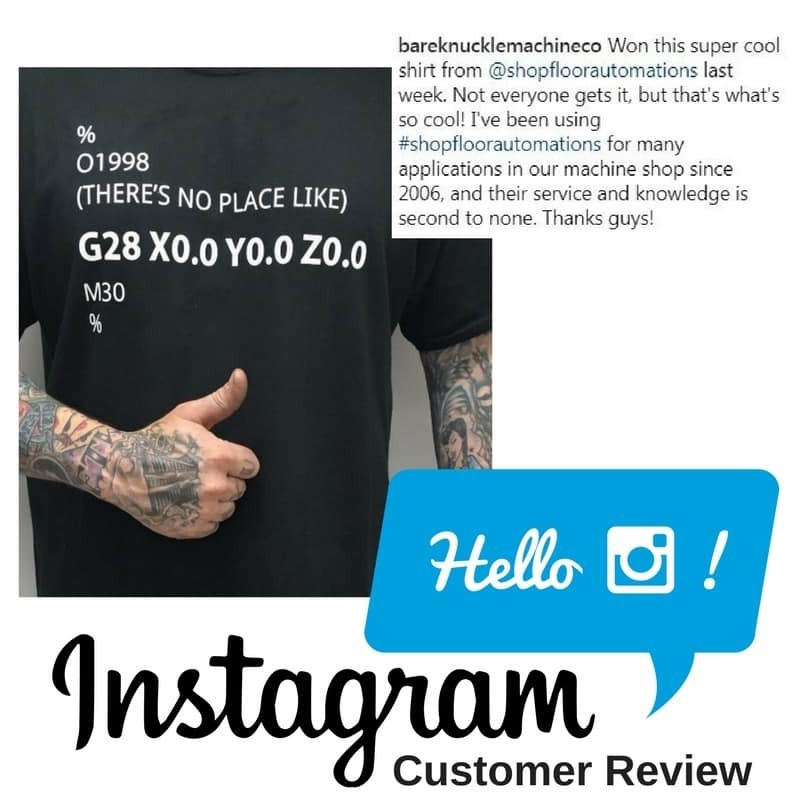 Our customers love our Software, Hardware & Support. See what they have to say! We are switching over our machines to a wireless remote request from Predator DNC Software with the help of Shop Floor Automations. 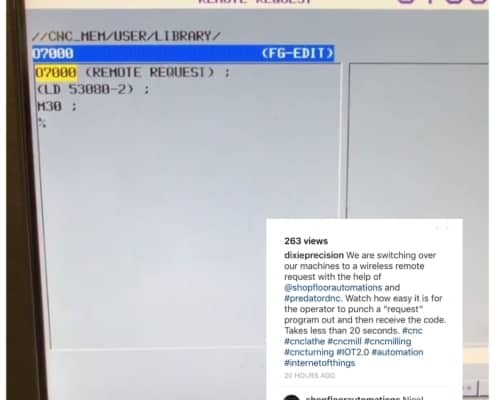 It’s so easy for the operator to punch a “request” program out and then receive the code. Takes less than 20 seconds. Our Predator DNC system is running so well, that after over two years, I have moved the keyboard and monitor off my desk and into a corner. It requires no maintenance and provides us with a trouble-free system. Our programs were so large that we couldn’t download them onto our machines. 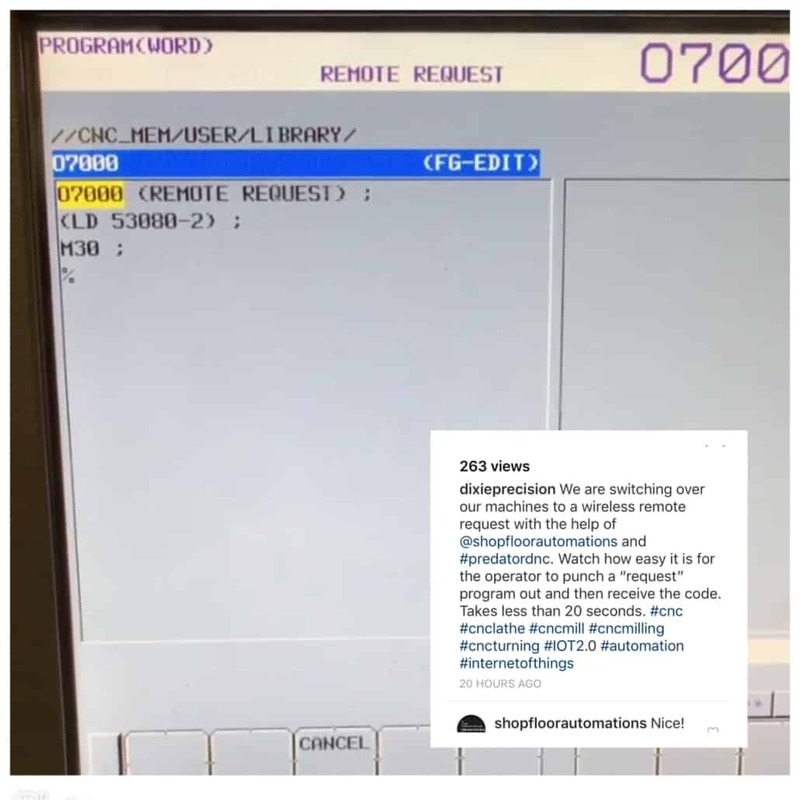 The NC programs were too large for memory on the machine and we had operator data input errors, so we started using a drip-feeding system from you guys…Ways the software has made our jobs easier? Eliminating the Operator data input helped eliminate human error/scrap, which allowed us to start our automation process. My favorite feature has been being able to implement Predator with other software we use for programming/verification/optimization. This has had a big impact on scrap rate and Setup time. We were using RS232 cables and switch boxes to send and receive our programs. Every time we moved a machine, we had to buy or build another cable. In some cases, we were taking a laptop to the machine to send/receive the programs that way. I’m now able to control the REV levels of my programs by keeping them secure on our network. This way we can ensure our employees are using the most current program available…Saving time means more and better throughput, cost savings, better margins on our profits and most importantly, better and more accurate delivery times to our customers. I had previous experience with SFA at another company. Guy Barrow helped me over the phone to purchase DNC software and Wired CNC hardware. So far, very helpful. We will be doing the install in the near future. I expect the system to do exactly what I intend for it to do – communicate with one old machine. I like that SFA is very eager to help. We needed to increase uptime and decrease downtime. SFA set us up with Predator DNC. I have dealt with Joshua Ray and Sam Wilkins, and the customer service is spot on! We needed to be able to communicate our CNCs and improve the ability of our mill. I’ve been using Predator DNC through you for a long time. Yes, I have recommended you to other shops, and I will continue to do so. Shane Vesthttp://www.powerrepair.net/Power Repair Service Inc. I have been assisted by Shop Floor Automations by installing Predator DNC software for me and they have been a wonderful help. They solved a lot of my issues and our tech Sam has been outstanding for us! We had programs pretty much stored everywhere…So what we needed to do was lock down the programs…I found SFA and go ahold of Amy Gates over there…Now, we are grabbing programs from the right directories, we are able to send to the machines, and when we are done with them, we can either delete them at the machines, or we can send them back to programming to make corrections…I would recommend you to other shops! Joey came in here and knocked it out of the park. We were looking for a system that would communicate through a wireless network, so we could get rid of the switch box and old wires running all over the machine shop. Predator DNC Software helped us eliminate our old switch box…The customer support was great. They were very supportive and fixed errors quick when we had a couple of problems. The Predator Software is working great! I really would like to thank SFA, and especially Amy, for the great phone support. She answered all my questions and was extremely polite, as were the guys in the tech department. Once again, thanks, and if we need anything else, we know who we will be calling! You guys helped us get our machines up and ready to go. No downloading or processing issues. You hooked up our Predator scanning system and allowed us to download files that were actually in quarantine that were not able to be downloaded again. We needed a DNC software system set up and every company I spoke with in the process recommended SFA. I went with Predator DNC and on site installation. Sam was our technician and we were very satisfied with the installation, and all the customer support we got. Now, I am no longer coding at the machines because DNC software is so simple to use. I would refer SFA to another shop because the knowledge of CNC machines your techs have is incredible. Thank you for coming out to get our machines running properly after Hurricane Harvey. Our DNC software didn’t work and the machines were not reading the programs correctly. Now the DNC software is running very well and the machines are running the correct programs like they should. I know it’s a small token, but thanks for the G-code mousepads! SFA updated our DNC system…Made sure everything was working. Made sure all the machines made the transition, in doing what they’re supposed to do. Get them to both load and punch out programs. Email notifications are working. Needed to transfer files to my Milltronics machine with a Centurion 5 controller. Everyone with your company has been very friendly and helpful. Tell them to Keep it up. Sam Mayhttp://www.geigerplastics.com Geiger Plastics Inc. I was introduced to Predator DNC a few years ago. The service from Amy Gates and Joshua Ray over the phone and in person have been great. We are satisfied so far with the product. Impressed with…how it can receive files from several machines at the same time. We’re using Scytec DataXchange and we have been able to increase our productivity by 25 percent just monitoring the machine utilization. 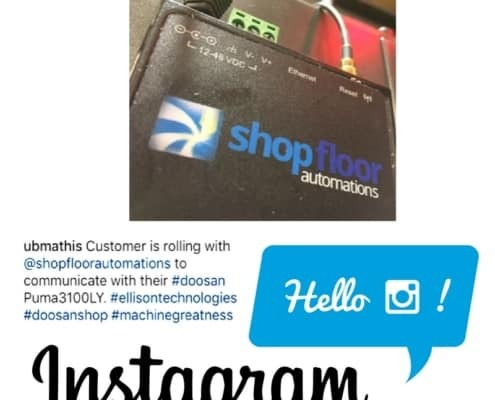 Shop Floor Automations did it all remotely and it worked great. The software is very easy to use and you will get more productivity out of your machines if you plug your machines into this software. It is having a positive impact on our productivity…we added the Scytec DataXchange stuff a few years ago from SFA and you guys are just good problem solvers for us! There was minimal startup cost and it requires little software management on the user end. Benefits are significant increases in machine utilization, better [internal] information flow. So far, it’s been really good to us to improve our machine efficiencies. Where we’re lacking, as far as our programming or our setups, things like that. It helps us really kind of narrow that all down to figure out what we really need to help our company move forward. I like how up to date it is, in a sense where something happens, in a couple of seconds, the whole system updates across the board…Being able to identify those problems that we’re having, right off the bat instead of having to do all this digging, trying to track back – “Why was the machine down here?” “What happened over here?” It really helps us to be able to identify that all right there, right away, every time. The company began to measure not just its cycle time and not just the processing of individual parts, but the entire performance of its CNC machines around the clock. Implementing machine monitoring software, the company began to measure the in-cycle and out-of-cycle time of 11 CNC machines…The first result of doing this, says Mr. Halley, was an almost immediate 5-percentage-point improvement in measured performance. We were able to connect some of our new machines and our NLX’s. What we did was look at downtime based on alarms. What we found is, we were able to save 50 hours just by reducing the amount of time we were stopping for doing tool changes and so forth. So, in a matter of three weeks, we were able to save that [time], go back and meet some of our targets for our hourly production! We were looking for some machine monitoring software to be able to see the effectiveness of our machines, so we went with Scytec DataXchange to monitor our machines. Amy has connected me with DataXchange and has been really helpful. Been dealing with Shop Floor Automations for a few years with different companies I’ve been at. I originally heard of SFA from word-of-mouth. We got to work with Shawn Dunne in person to install wireless networking and adapters. My favorite features from the changes implemented are Process control, process security, and enhanced availability of knowledge base information. Total cost was also very affordable. I bought the Portable (USB Connect) unit for some of our older machines and it definitely saved us a lot of time and a lot of money from running around, doing it with a laptop. Especially a lot of the older units with floppy drives in them, the PCMCIA cards, and they kind of died out. In a fit of frustration with my software, I Googled my issue and your YouTube video came up for the USB Portable. We have been a customer of yours for over 12 years now, and it’s been great with the support. The Wireless DNC has been fantastic for our production. We went from losing the wired system to [choosing] a wireless system, and it actually works very well. It’s been very easy and we keep continuing with a product that works great for us. Yes, we have definitely been recommending you to other shops. I would recommend the Pendant USB Connect to any shop struggling with floppy drives or being tethered to a cable and computer using the serial port. We were able to gain shop floor space by removing that computer and stand, as well as getting rid of the footsteps required to ready the computer and the CNC to communicate by RS232. I just wanted to tell you how much I appreciate all the help SFA has given me over the last year or so. You are truly customer satisfaction dedicated and a hard working company. I also absolutely love the new hardware system you installed for me last week. It works like a champ. Please keep me updated with new things from SFA. I made the first purchase in late 2015 or early 2016 [of a USB Connect Pendant) for a Fanuc 16 control. Most recently, I purchased two items from you – one for a Mazak with a M2 control and one for a Mazak with an Mplus control. After receiving quotes from Mazak on expanding the memory on these two controls, I decided to search the web for any other options. That’s how I found SFA…the boxes work great, have more options that we utilize and overall saved us $6,000. Thanks for the GREAT product! Downloading programs took forever. Found SFA online, looking to use USB to CNC adapter – bought the Portable USB Connect. The customer support from Guy Barrow was great. I’m enjoying much easier, quicker downloads. My favorite feature was being able to get rid of our old process to download and save programs to and from the machine tool. I recommend SFA’s easy solutions and the customer support when having problems getting things to work properly. There is not enough room on floppy’s for the programs we need to send to our Haas TM1. I found SFA after doing a Google search looking for a floppy to USB adaptor. 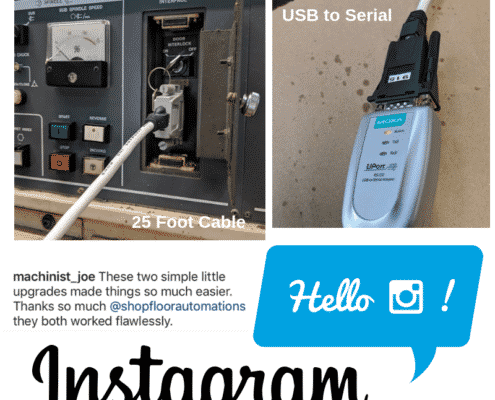 Greg Mercurio really helped us out, both through emails and on the phone, to make sure we had everything we needed…The USB Connect Pendant instructions were very easy to understand to follow. We can now move large programs to the machine very easily and quickly. My favorite part of the USB is just how large the programs can be. Working with the floppy drive was getting to be a hassle. It was aggravating to mess with, as far as transferring data back and forth. Slow. The Floppy Connect was the easiest way to fix the problem to just take a USB drive in and out. Makes transferring programs easier and smoother, and no more buying shop floor floppy disks. Chad Masseyhttps://www.facebook.com/pages/Robine-and-Welch-Machine-and-Tool-Company/154312687938780Robine & Welch Machine & Tool Co.
We went with a Pendant USB Unit. Now, we use thumb drives on almost all of our other CNC controls, so it’s made it easier for the guys transferring info. Now there’s more consistency with the transferring process. Along with that, there’s no cords. My favorite feature is uniformity to our other more modern controls. I needed a simple method of drip feeding to an older Fanuc 11M controller on a VMC. Guy Barrow helped me out and absolutely, he was a great help. Very knowledgeable. The Portable USB Connect from SFA is a simple solution to communicate with my VMC’s. I get jobs in and out quickly with no DNC communication issues. It surprised me that the product is straightforward and easy to use. 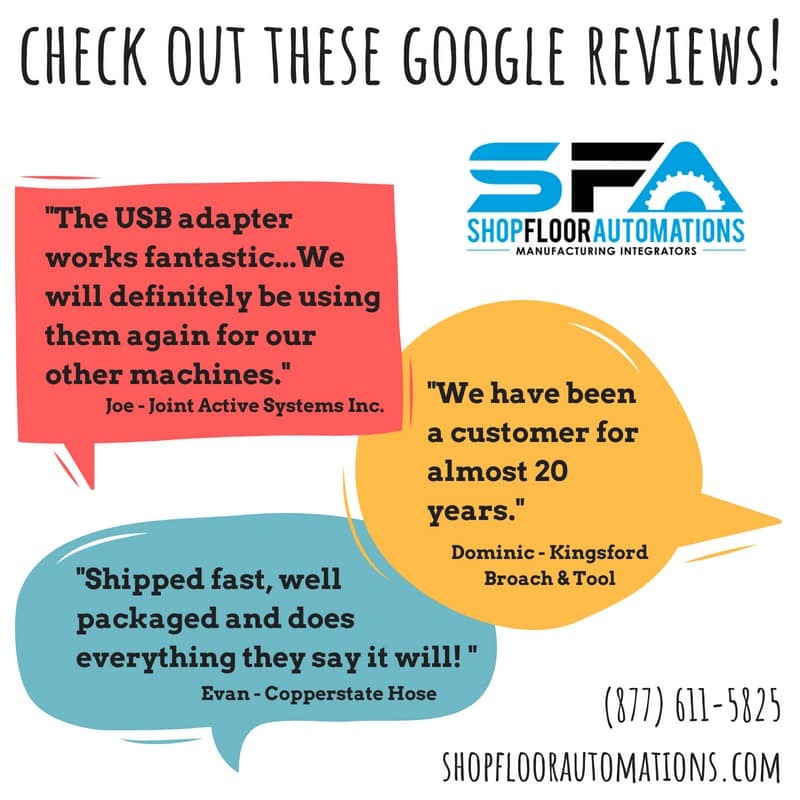 I’d recommend SFA for their quality, easy to use products, and fast support. In a job shop, a factor that may seem trivial can have a big impact on overall production efficiency. For Doug Stollen, owner of Stollen Machine & Tool Co., that factor was the cable connection he used to transport CNC programs from his computer to the machines on his shop floor. 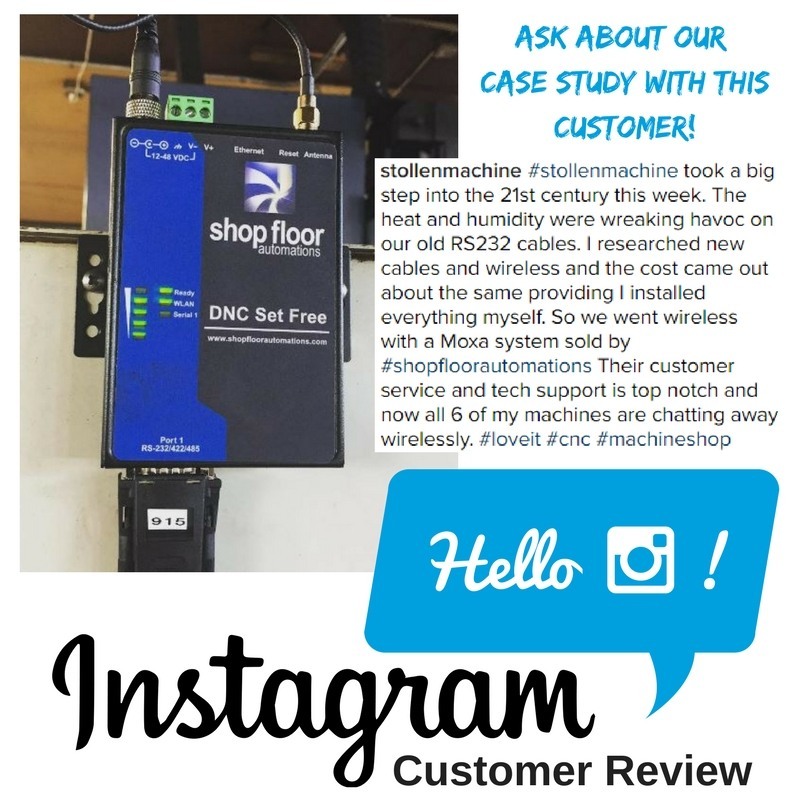 When he realized how much time he was losing due to their unreliability, he invested in six wireless data-transfer systems from Shop Floor Automations (La Mesa, California). 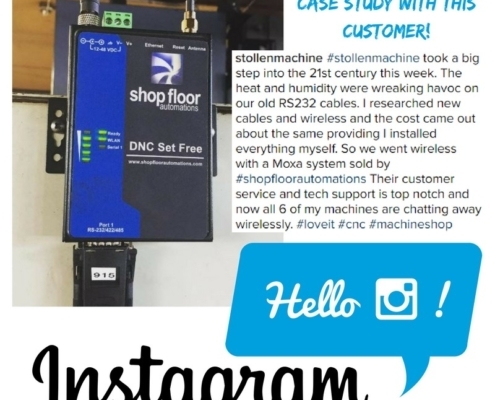 Mr. Stollen says this simple change has saved him 15 percent of his time per day…Ultimately, he decided to replace the cable system with six RS232 wireless units from Shop Floor Automations that enable users to connect the machines to wireless networks for transferring data. The units are designed to withstand industrial environments, and he installed them on six different machines in a single day…With the new wireless system, programs are fully transferred from the computer to the machine every time, and Mr. Stollen does not have to check the code multiple times to ensure it has completely transferred. 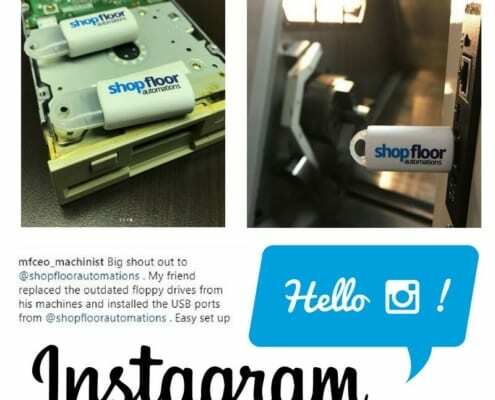 With this simple addition to their hardware setup, Dutchcreen is now able to generate their CNC programs with their CAD software and transfer them to the CNC machine with a USB stick. As a bonus, they also have a backup of all the CNC programs that were on their machine. Very good service and follow through. Would be happy to recommend to anyone. Did everything in the order we requested, without any problems. Fixed an ongoing problem we had with one machine. I purchased a used Okuma lathe and proceeded to try to get it to communicate with my DNC software to no avail. 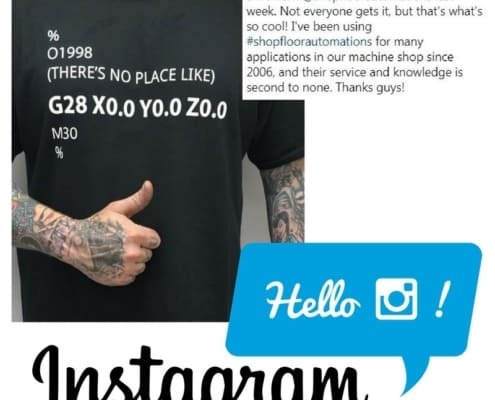 After 2 years, 15 cables, 12 manuals, 100s of pages of parameter settings, and advice from every expert I could find, I stumbled across Shop Floor Automations. Between their expert advice, cabling, and Predator Software, I was up and running in 20 minutes. SFA worked with the DNC software to accommodate our specific data needs and changed the hardware settings so that they all operate the same. Our original installation had the program working differently – now I know that they could have been set up better. Going the extra mile – during the install, the Tech fixed hardware we thought to be broken. Tech went out of his way to ensure the best experience possible. Josh is a fantastic tech – I will be happy to have him back for follow-up of the project in October. Very knowledgeable and helpful. I am very pleased with where our money went. SFA went above and beyond what was required. They quickly set our new machines to our network. They communicate well and finish the job in a timely manner. I had to call for support because I am too busy to take the time to read directions. I needed a basic plug and play, and by calling, that is what I got. Your team did an excellent job getting us out of a jam with recent damage to our ExtremeDNC PC which got zapped by lightning. Within minutes after its arrival, only about 14 hours after my phone call to your tech named Guy, my guys had it working to load programs into our CNC machines. I have been extremely satisfied with the Predator Software, with SFA and their technical support. You have been very helpful and always available when questions arise. This is not the case with some technical support teams and it is very frustrating when it takes 3 or 4 days to get a response. I rate your technical support and the Predator Software as excellent. You had a very good team that knew the product. This made the process smooth and efficient. Looking for emulators to replace our floppy drives, as the archeological dig has failed to turn up usable drives or disks any longer. Great interaction between SFA’s team members. Paul Knepperhttp://www.bmandf.comBennett Machine & Fab Inc. I like SFA’s configuration and system knowledge. The whole process was fantastic. SFA best prepared and executed a plan to provide the software & people needed to put it all in place. Installation was quick and downtime was limited. Installer knew what he was doing – it was done very quickly and correct. For years, our company had problems with communication between the computer and the CNC mills. For the first time in a long time, things are operating smoothly. 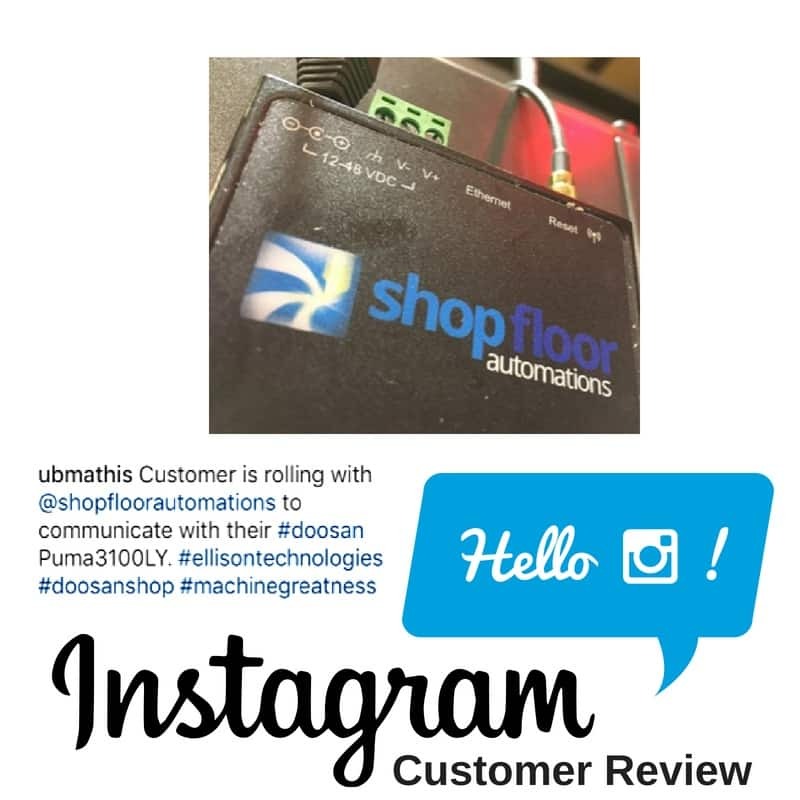 One call to Shop Floor Automations and they had the software plus hardware we needed to fix the problem. The level of professionalism and support we receive is above and beyond any other company we have dealt with. Customer service is a high priority for my company, and your company delivers the level of support we require. I was looking for a solution to our CNC communication and CNC program storage problems…A process that had each machine down for only about 10 to 15 minutes for setup now works flawlessly. It just works! 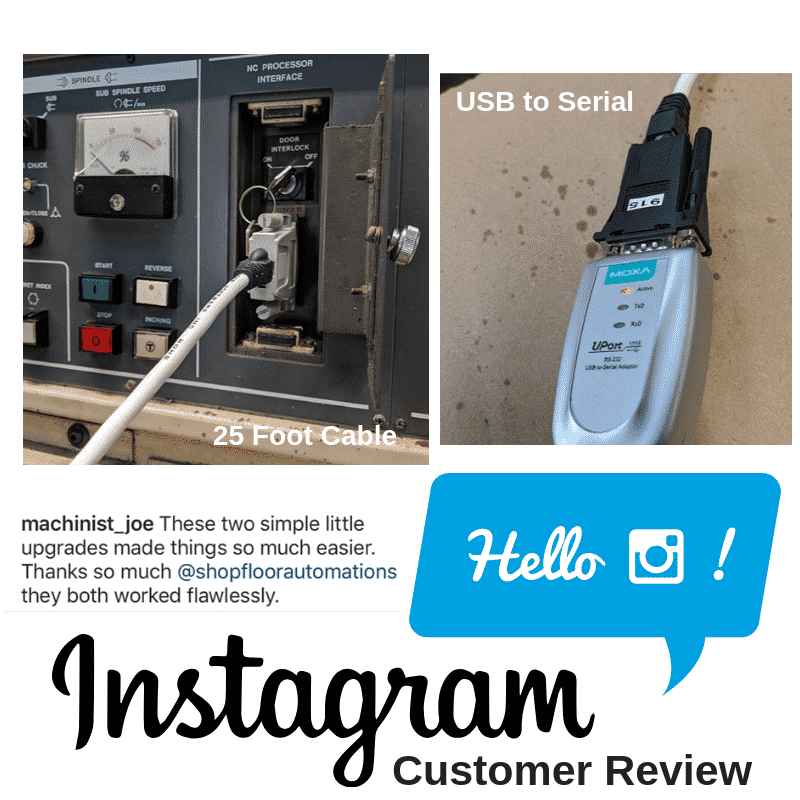 Shop Floor Automations came out and helped us figure out our communication system. Previously, our guys would come in manually and put it on a USB, or managed to put a program into the system itself. Now, we have a lot less downtime. Wireless was not connecting in our shop, so Joshua Ray came out to hard wire the machines. We do not have any more connection problems. 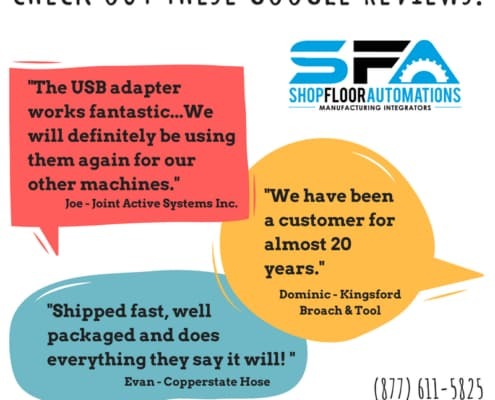 We have been working with SFA & I would recommend SFA to any other shop that needs their machines connected. 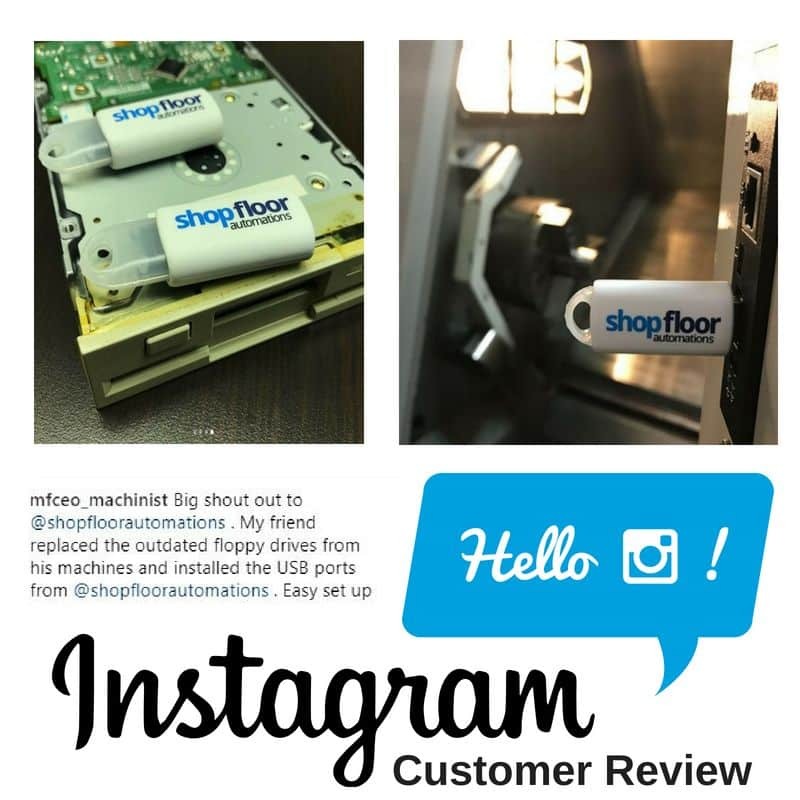 We were having issues with translating a program from our CAD/CAM software, to our USB drive, to the CNC, which was taking time for a slow download…we would absolutely recommend you to other shops because it was easy, the explanation had no problems, no hangups, and it’s easy to use. The company is very responsive. Great on service. I don’t have to wait an age to get a reply on service calls. It’s okay buying software – that’s great. Anybody could sell you it, but it’s the service. It’s what you get after you’ve paid your dollars. It’s what kind of service you get for the product. Most of the time, I’m away from my desk so I felt bad not being able to communicate on the phone. However, Guy Barrow was very understanding of that and helped guide me as needed. The USB Connect Pendant unit does what it was advertised to do. I would like to commend your staff for being so on top of their customer service. I’ve been a customer with SFA for a few years. Recently, SFA remotely diagnosed a faulty USB anywhere device in our internal network. SFA accepted my order over the phone and the order was placed promptly, USB shipped, and I received full documentation, receipt, and tracking number without having to follow-up. Excellent service that is unfortunately not so common everywhere. Just damn refreshing that I don’t have to follow up for anything. In our multitasking and fast paced environment, this is just exceptional service. I want to take the time to thank SFA for your support in giving me a better understanding of the system and how to use it with the training you have provided…With the barriers I faced, whether it was the license issue, hardware or software settings, you provided swift support to get us going in the right direction…I feel confident in saying that you guys will help me with that. Stephen M Toddhttps://www.parker.com/portal/site/PARKER/menuitem.b90576e27a4d71ae1bfcc510237ad1ca/?vgnextoid=c38888b5bd16e010VgnVCM1000000308a8c0RCRD&vgnextfmt=ENParker Hannifin Corp.
Bought a USB Connect Pendant. Saved our company thousands by not having to purchase OEM memory. Thank you for the product. It works great! I had an old-school floppy drive in my Haas, so I found SFA on YouTube. I bought the floppy drive emulator and it works absolutely wonderful! It’s super easy to load programs from Fusion 360 CAD/CAM via the floppy, and my Haas makes parts now. What I did just worked – I got you on speed dial!